Sabian is the second largest cymbal company in the world. Sabian was founded in 1981 in Meductic, NB , Canada by Robert Zildjian. Robert used to be a 50% partner in Zildjian Cymbals, but later left the company due to a family feud started when their father Avedis Zildjian had turned control of the Zildjian Cymbal Company over to the two brothers. 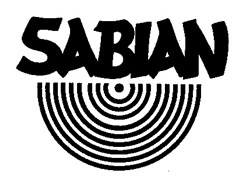 Sabian Cymbals was formerly known as AZCO, but later had to change its name due to copyright issues. Robert came up with the name Sabian from taking the first two letters of each of his three children’s names: Sally, Billy, and Andy. Sabian currently endorses: Neil Peart, Jack Dejohnette, Mike Portnoy, Mike Wengren, Steve Ferrone, Tyler Stewart, Carmin Appice, Chad Smith, John Blackwell, Rod Morgenstein, Rocky Gray, Kevin Oshinskle, Phil Collins, Will Calhoun, Billy Cobham, Bernard Purdie, Mike Michaklow, Evelyn Glennie, Zoro, and Dave Weckl. B8 Pro – These cymbals are very close to the B8’s but they have a slightly better finish, giving the cymbals a more smooth, bright tone. There are slightly more expensive than the B8 cymbals. XS 20 – These cymbals are in the “semi-professional” category of Sabians cymbals. They are made from a B20 bronze alloy. Compared to the B8 cymbals they have much more tone and better projection. AA – These cymbals are designed from B20 Bronze, they have a very clean, clear, focused sound, designed to “cut” though other stage sounds. AAX – These cymbals have a more distinctive and modern tone than the AA cymbals. They are about the same price as AA cymbals but they less tones available, but the tones are more “pure and bright”. HH – Sabians Hand Hammered Cymbals are more expensive than the AA and AAX Cymbals because of the craftsmanship that is involved. These cymbals have a slightly darker and jazzy sound to them. They don’t cut though other voices in your band like the AA’s do but they instead have a more dry sound to them. HHX – These cymbals have a slightly more intense and shimmering sound than the HH cymbals. Signature – Many drummers now have signature cymbals with Sabian. Drummers like Dave Weckl, Chad Smith, Mike Portnoy, and Neil Peart all have their own Signature Sabian Cymbals. Paragon – Paragon is a mix of the AA, AAX, and HH lines. Sabian worked with Neil Peart to help design these cymbals with such a powerful and fresh sound. Sabian Quiet Tone Practice Pad - Sabian has recently got into making their own practice pads for drummers. Sabians version of the practice pad includes a rim and replacable drum head. How To Take Care Of Your Cymbals - A step by step guide to properly taking care of your cymbals.